Correctional Facilities Rely on Software Designed using ActiveReports to Manage Inmate Visitor Access. Today’s correctional institutions are using technology to improve their day to day operations. 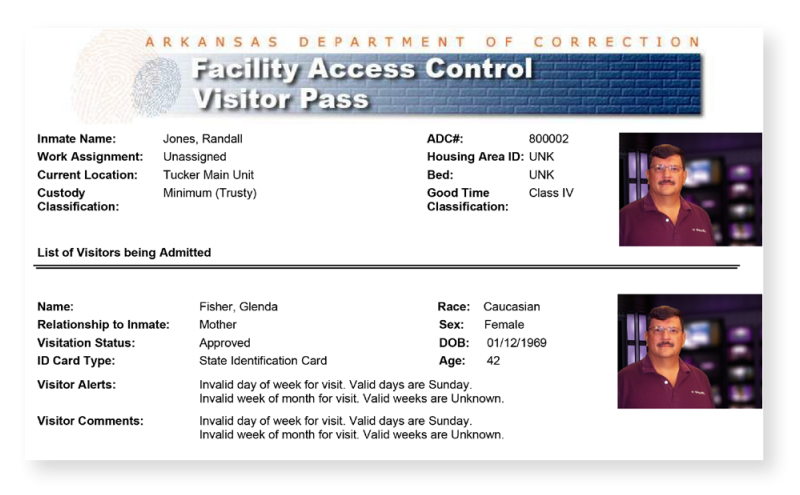 States including Arkansas, Wisconsin, Kentucky and California have turned to Marquis Software, a development solution provider of enterprise corrections software, to manage a project which involves moving from a hand written visitor pass system to a secure automated process. When an individual elects to visit an incarcerated person in a state or federal penitentiary, they are subject to an extensive approval process and are given strict guidelines for planning the visit. Upon arrival, one of the steps the visitor will go through is a obtaining a pass that will act as their identification card and grant them access to select areas of the prison. Marquis Software created a software program that automates the collection of information such as the inmates name, location, and custody classification. This information along with the name of the visitor, their relationship to the inmate along with any alerts is then generated into a sophisticated report, using a product named ActiveReports. The visitors pass system developed using ActiveReports was designed to be an integral component of the overall daily operations. “The interactivity of the controls within ActiveReports permitted us to meet the security and administration requirement for dual printing of passes, each at a different location,” said Roberts. Email press@grapecity.com or look for us at any of the upcoming community events.